We're almost a week away from Halloween! Don't you just love this holiday?! Can you tell that I'm excited?? I mean, all of my posts this week have been Halloween themed and I don't hate it. 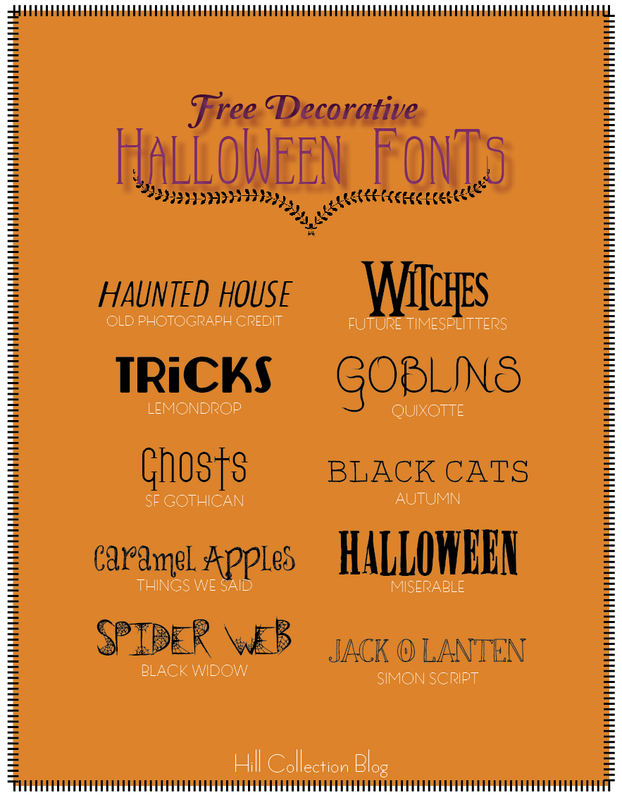 Today I'm sharing my top 10 FREE Halloween fonts with you. When I make cards, or the graphics for my for this blog and my food blog, I use some of these great holiday-inspired fonts. I completely believe that fonts really make all the difference and I love finding new ones to use. So here you have it, my favorites for Halloween. The best part, they're free. To get these fonts, click the link below the image! And, if you're looking for some Halloween dishes for next week, stay tuned on my foodie blog because I'll be sharing some spooktacular recipes (you know you love my corniness) all week long starting Monday! And go check out this week's pumpkin-inspired recipes! One more thing, if you're looking for some simple, last-minute Halloween decorations, check out my DIY Mason Jar Halloween Luminaries and the DIY Bat Cutout that you can print, cutout and duplicate on the walls at your house! ALSO, a co-worker of mine runs an Etsy shop, DargerVintage, an she's offering my readers a discount with the coupon code HILLREADER. You will get 35% off of your purchase. Check her vintage clothing finds out!